You can't just try to be more like the Lord Jesus Christ. If you try to simply imitate the him, you will become a cheap imitation like a poor photocopy or worse a bander copy (remember those?). Or a better comparison is that trying to be like Jesus will make you like one of those plastic Jesus models (see above) - looks like him but does not have anything much going on inside. That's not how to be like Jesus, to be like Jesus you need to have his Spirit inside you. And this is how that's done: mirroring. Mirroring is the behaviour in which one person copies another person accurately and unconsciously usually while in social interaction with them. It may include all aspects of their behaviour. Mirroring is like looking at another person as if they are a mirror, so you end up reflecting them. 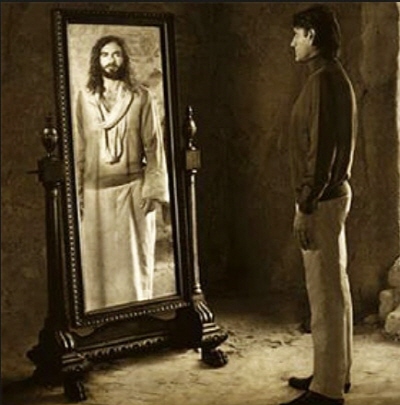 Look at Jesus and reflect him - to do this effectively the image must be clear, no clouding on the mirror surface! Unforgiveness, either you not forgiving someone else or you not repenting of some sin can have this clouding effect. For this, you need Jesus to forgive you and set you free from sin. You can't do it in your own strength. Then you need to face in the right direction to see in the mirror clearly - this means that to be like Jesus you need to determine to go the way he wants. This entails reading the Bible regularly and praying. If you take on these three habits you will mirror Jesus and become like him: 1. Forgive others unilaterally 2. repent of your all your sins big and small to God and ask for forgiveness 3. read the Bible and pray each and every day. But what is the advantage of being like Jesus?